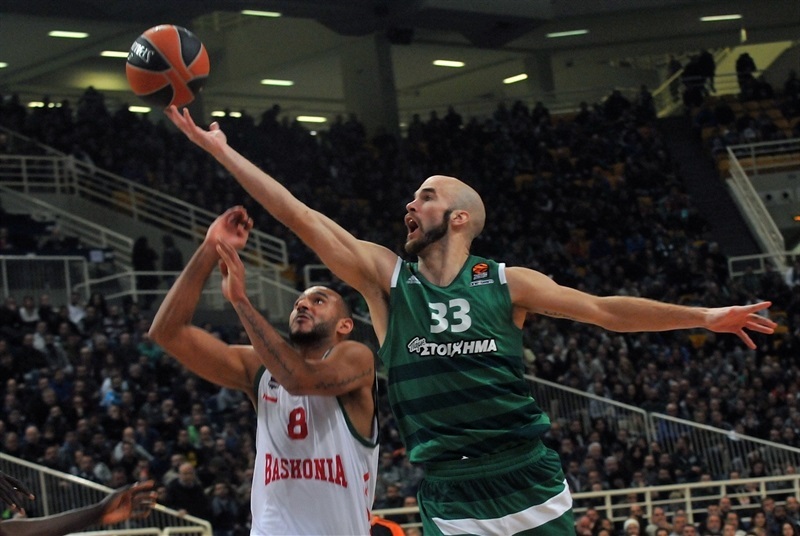 In a thriller that went down to the final second, Panathinaikos Superfoods Athens defeated Baskonia Vitoria-Gasteiz 69-68 in the Greek capital on Friday. 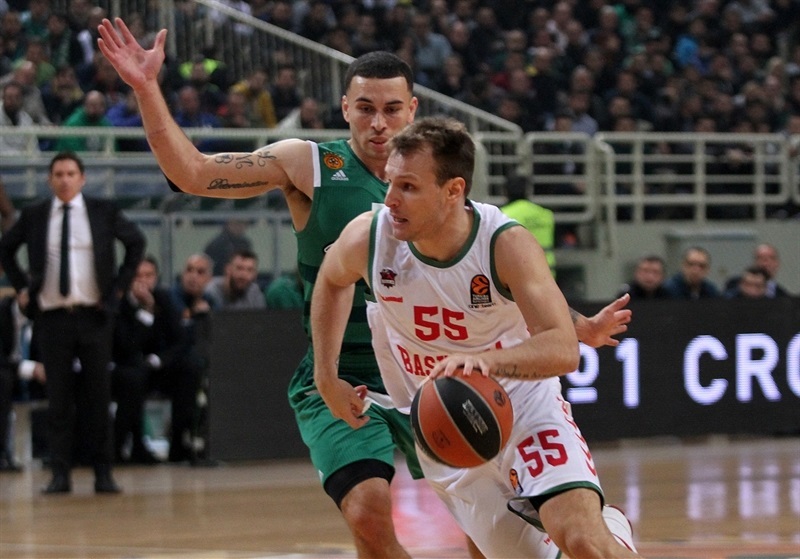 Panathinaikos and Baskonia now have 9-5 records in the Turkish Airlines Euroleague Regular Season, just like Real Madrid, Olympiacos Piraeus and Fenerbahce Istanbul. Chris Singleton led the winners with 23 points - 19 of them in the first quarter. 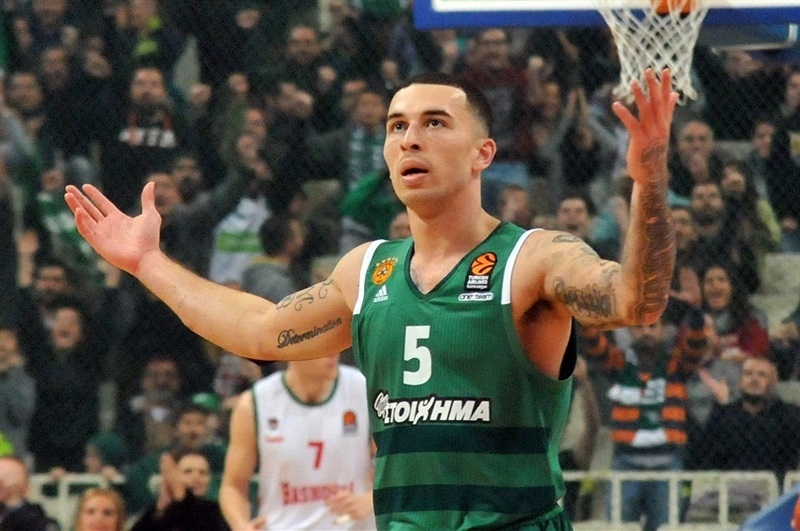 Mike James added 16 and Nick Calathes amassed 14 points, 6 rebounds, 6 assists and 4 steals for the Greens. Toko Shengelia led Baskonia with 17 points, Adam Hanga added 12, Rodrigue Beaubois had 11 andIlimane Diop 10 for the visitors. 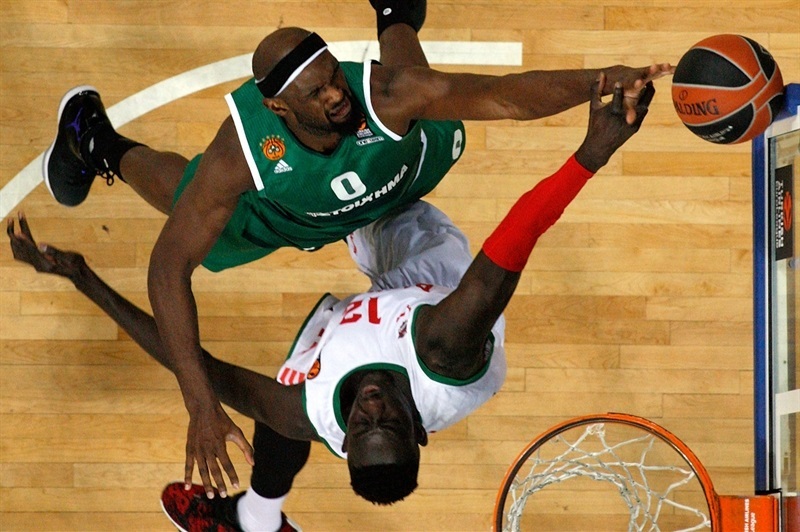 Baskonia outrebounded Panathinaikos by 9-23 before halftime, getting 19 defensive boards to Panathinaikos's 4. Baskonia limited the hosts to 8-of-20 two-point shooting (40%) and 4-of-15 three-pointers (26.7%) to get a 37-41 margin at the break. 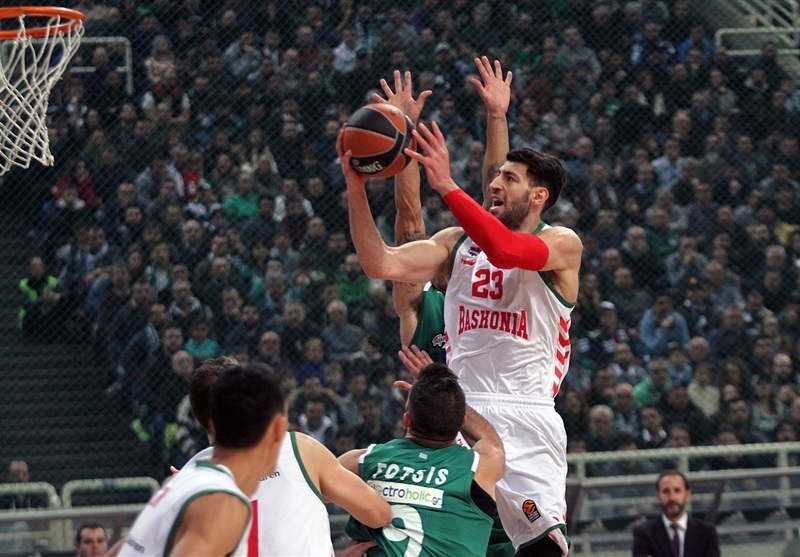 Despite being outrebounded 28-44, Panathinaikos handled the ball better, taking 11 steals to just 8 turnovers and forcing Baskonia to finish the game with 19 turnovers. Hanga sank a floater and had a huge block off the glass in a 0-6 run that Beaubois capped with free throws. 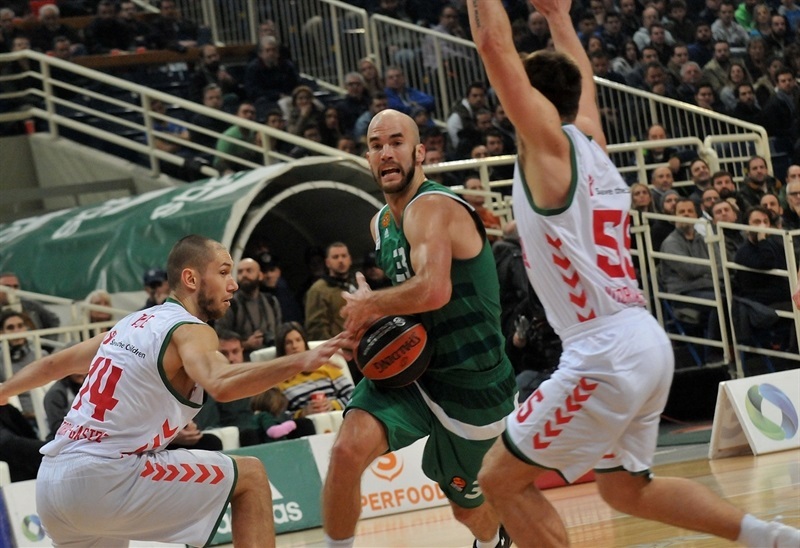 Calathes rescued Panathinaikos with consecutive layups and Singleton followed free throws with a triple that gave the hosts their first lead, 9-8. 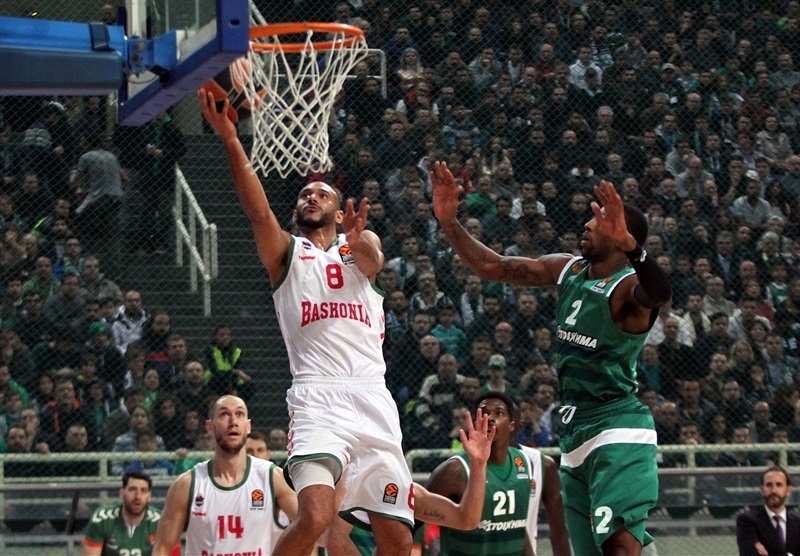 Singleton kept pacing Panathinaikos with 4 free throws, a dunk and a triple for a 20-14 margin. Singleton finished the first quarter with 19 points and his third bomb from downtown made it a double-digit game, 27-16. Shengelia brought Baskonia within 27-18 after 10 minutes. Shengelia stayed on fire early in the second quarter and a layup by Beaubois tied the game at 27-27. 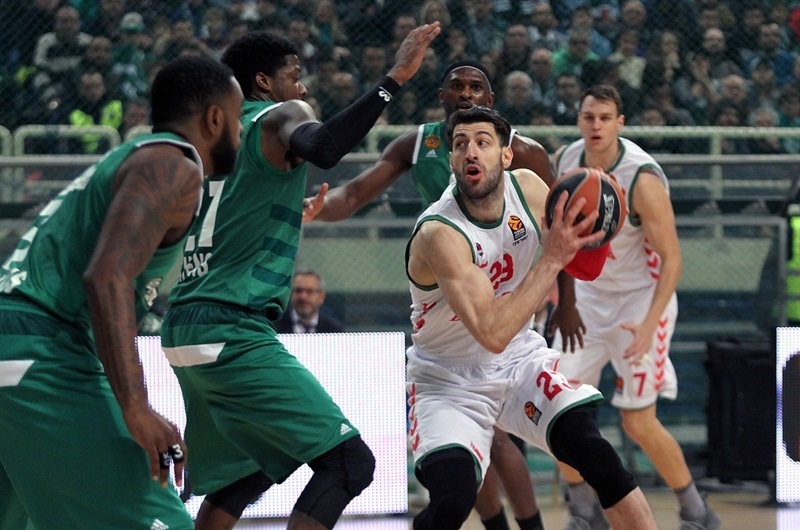 Panathinaikos called timeout, but a jumper by Diop soon completed Baskonia's comeback, 30-31. 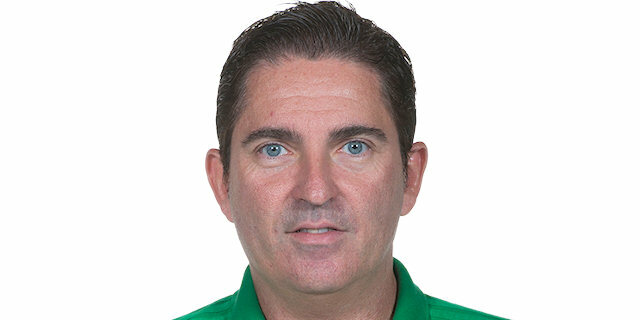 James tried to change things for Panathinaikos, but a jumper by Kim Tillie, a put-back slam by Diop and a driving layup by Rafa Luz gave Baskonia a 37-41 edge at halftime. Hanga took over with a driving layup and a three-pointer that boosted his team's lead to 38-47 soon after the break. James Feldeine followed free throws with a huge slam and got help from Demetris Nichols and Calathes to get Panathinaikos within 49-51. Johannes Voigtmann had 4 points in a 0-6 run and Larkin added a driving layup to make it 55-59 after 30 minutes. Three-pointers by K.C. 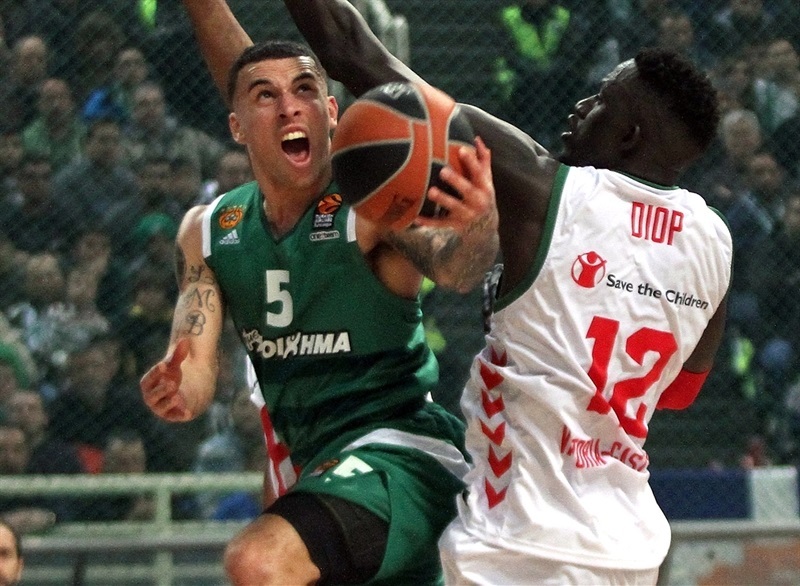 Rivers and James helped Panathinaikos regain the lead at 65-63 midway through the fourth quarter. 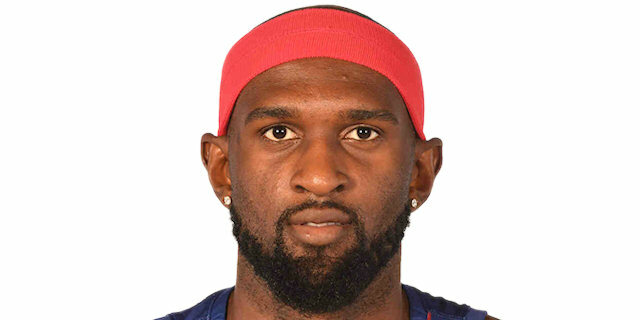 James followed free throws with a jumper, but Beaubois singlehandedly brought Baskonia within 69-68. The guests got the ball with 15.1 seconds and Beaubois slashed to the basket, but could not get a shot up in time. "We are happy for this win. It was a tough game. We didn't play well tonight, especially on offense, but also on defense in the second quarter, when we played really bad. In the second half, we fought a lot, played to win and in the end, it was a very important win for us. We were in a moment in which we were not playing well on offense but we had allowed just 9 points (late in the fourth quarter). We believed it was the way to win the game. There are no rules in the final seconds, you have to take the decision you think it will work for you. That doesn't mean that is the decision I would always take, depends on each game. It was an important win, but all of them are. We felt this was a chance for us to get to the upper part of the standings but know that Baskonia did not lose a close game until now. We managed to change that today and get this win, but I give it the same value than any other win has. Every game is different - we played more under pressure tonight and this is when we have to improve a lot of things. We missed 12 free throws and had 44% two-point shooting percentage, very low numbers for a game of this level. 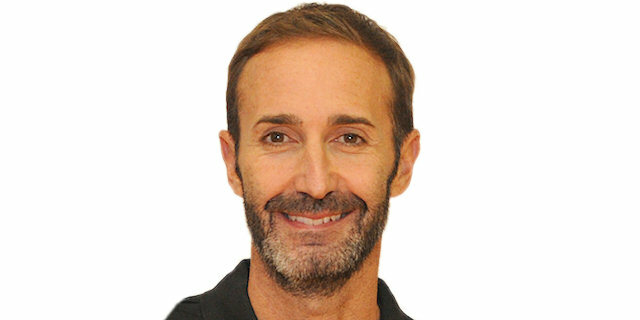 On the other hand, we learned we must keep fighting and play good defense even if we are not playing well." "We are a little but frustrated because of the last play of the game. 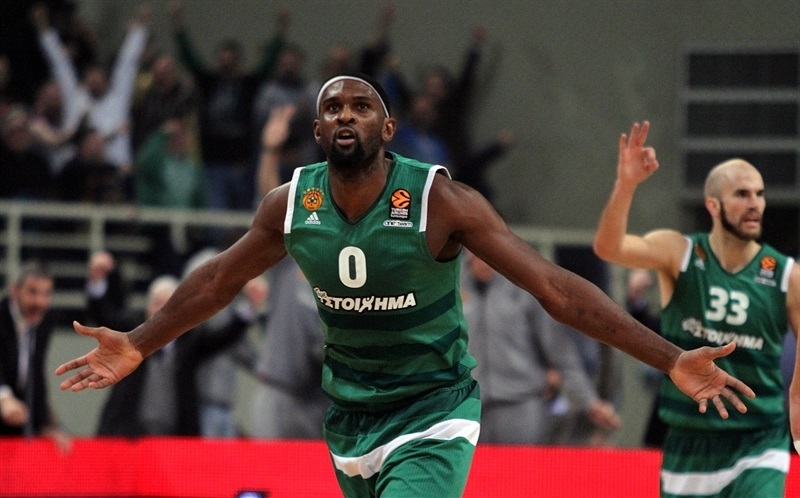 We had the opportunity to beat Panathinaikos in Athens. We played very good defense after the opening 10 minutes, because they started very well. After that, we were leading and taking control of the game for the next 20 minutes. Turnovers were crucial in this game because of the many times that we didn't shoot, turning the ball over, even in the final play. We have to be a little bit happy because we competed very well and almost beat Panathinaikos here, but it is not enough because we want to win every night. When you are playing so-so and committing many turnovers, the faith that you have on defense can gave you the opportunity to win the game. It is true that we have to improve that, especially when our most important players are making decision. Larkin had a hand problem today and sometimes he made bad decisions passing the ball. We are very happy with him because he is playing excellent this year. We competed all the way even with 19 turnovers." "It was tough. We had to grind it out. There was a long stretch in which neither team scored. We knew it was going to come down to defense, especially in the second half. I am glad we prevailed. It was a very intense game. We knew it was a big game for both, so now we are tied in the standings, but we have the tie-breaker. We have to go to their house and play. 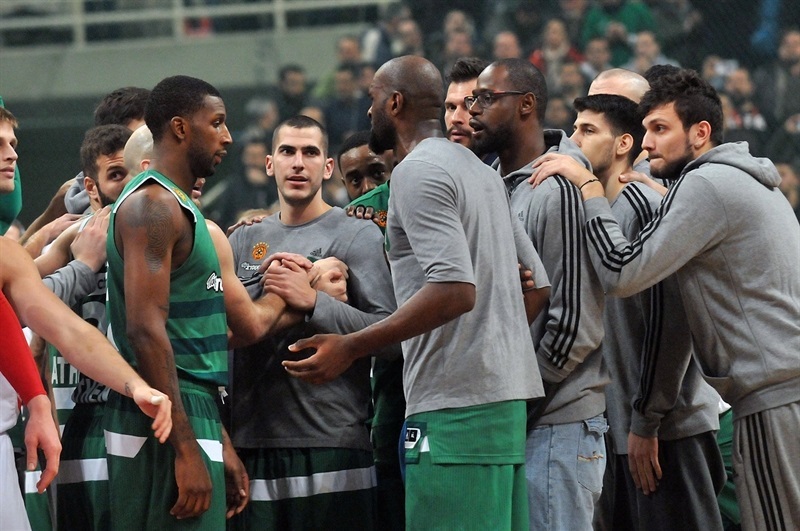 This is EuroLeague basketball; it was a close game. I just came out hard in the first half, that's about it. I knew I had to focus on defense. It was a great win for us."